Amanda Clay Powers is the new Professor and Dean of Library Services at Mississippi University for Women. Dean Powers has a Masters in Library Science from Simmons Graduate School of Library and Information Science, and Bachelors from Wellesley College in English Literature. Prior to joining MUW, she was the Coordinator of Research Services at Mississippi State University. Dean Powers has served as President and Treasurer of the Mississippi Library Association and is currently the Convener of the Association of College and Research Libraries (ACRL) Public Services Discussion Group. Her research interests include reference assessment, virtual reference, and the use of social media in academia. Jennifer Todd joined Hinds Community College Libraries July 18, 2016 as the Circulation Librarian at the McLendon Library on the Raymond Campus. She comes from the Mississippi Library Commission where she previously served as the Digital Services Consultant for over four years. Aside from the state agency, she has previous experience working in both academic and public libraries as a circulation assistant, reference assistant, and cataloger. She received her Master’s Degree in Library and Information Science from the University of Southern Mississippi in May 2012. She is currently pursuing a Computer Network degree from Hinds. Jackie Quinn, Administrative Librarian for the Jackson ATC Campus, has been selected to be the director of the Copiah Lincoln Community College Library beginning August 1st. Ms. Quinn has worked for Hinds since 1989. She earned her associate's degree from Hinds in 1989 and began working at one of the Hinds' libraries shortly after. She began as a library technical assistant and in the late 1990s, went back and earned her BA. In early 2000, she continued graduate work earning her MLIS from USM in 2003. Because of her knowledge and quality service, she was immediately assigned an administrative library position at Jackson ATC where she has worked since. Besides running ATC's library, Ms. Quinn has taught Developmental classes for Hinds many semesters. She continues her education working on her doctorate in Library Science. She is well loved by faculty and student alike at ATC where she was heavily involved with her faculty and campus helping with M2M, ASG, campus registrations, and Black History programs. Ms. Quinn has also been involved in many professional organizations through the years including WHEM, ACRL, ALA and MLA (the state library association) including The Black Caucus and Two Year College Roundtables. Jamie Bounds Wilson was recently named College Librarian at the Millsaps-Wilson Library, Millsaps College. Ms. Wilson had previously worked as the Electronic Resources & Web Services Librarian and as the Acquisitions Librarian at Millsaps College. Prior to joining the faculty at Millsaps College, Ms. Wilson was employed with the Biloxi Public Libraries, Harrison County Library System as the Local History & Genealogy Librarian and as the Branch Manager of the Margaret S. Sherry Memorial Library. Mariah West Grant was recently named the Public Services and Instruction Librarian at the Millsaps-Wilson Library, Millsaps College. Ms. Grant joined the faculty at Millsaps College in 2015 as the Acquisitions and Serials Librarian. Ms. Grant was previously employed with the Mississippi Valley State University Library as the University Archivist and as the Collection Development and Reference Librarian. Tom Henderson, College Librarian and Associate Professor at Millsaps College, retired in June 2016. Mr. Henderson joined the faculty at Millsaps College in 1997, and he has served as the College Librarian since 2000. He now holds the rank of Emeritus College Librarian at Millsaps College. He previously worked at the Mississippi Library Commission, Mississippi State University Libraries, and the Mississippi Department of Archives and History. Mr. Henderson earned his MSLS from Florida State University in 1975 and his BA from the University of Southern Mississippi in 1971. Mr. Henderson served as the Treasurer of Mississippi Library Association in 1993-1994. At various points, he chaired the following MLA committees and roundtables: Internal Audit Committee, GODORT, Special Collections Roundtable, Library Instruction Roundtable, Conservation Committee, Education Committee, and Northeast Region. He coordinated the Private Academic Libraries of Mississippi (PALMS) group for ten years. He was also active in many other professional organizations. Please join the Millsaps College community in congratulating Mr. Henderson on the occasion of his retirement. We thank Mr. Henderson for his dedication and contributions to the field of librarianship, and we will always appreciate his leadership and guidance. It is with great sadness that we inform you of the death of Miss Marsha Case. Marsha Ann Case, 59, passed away Saturday, August 6, 2016 at her home in Jackson. Visitation will be Thursday, August 11th from 5-8 PM and Friday, August 12th from 12 PM until the 1:00 PM Funeral Service at Chancellor Funeral Home in Florence. Burial will follow at Antioch Primitive Baptist Church in Forest, MS.
Marsha was associated with the HCLS retiring as the Assistant Director. The Department of Technical Services was under her supervision. She served as Secretary of the Mississippi Library Association. She received her Bachelor’s Degree in Accounting from MSU and her Master’s Degree in Library Science from USM. She was a Grant Writer. She loved animals, books and was a great story teller. She enjoyed playing cards and doing puzzles and was active in her church. Ms. Case was preceded in death by her parents, James and Zora Case; and two brothers, James Case Jr and John Albert Case. She is survived by her brothers, Charles Fredrick Case of Alexandria, VA and Michael Anderson of Florida; sisters, Peggy Case Mott of Bossier City, LA and Jeannine Case Schneider of Las Cruces, NM; 5 Nieces, 8 Nephews and their families and many great nieces and nephews. In lieu of flowers, memorials may be made to the Mississippi Animal Rescue League. Online guestbook may be signed at www.chancellorfuneralhome.com. Paul McCarver, Associate Professor, Senior Research Services Librarian, and Business Librarian at Cook Library, will retire at the end of June 2016. Mr. McCarver began his career at The University of Southern Mississippi in October 1980 and has been an esteemed librarian and respected member of the Southern Miss community throughout the intervening thirty-plus years. Paul McCarver earned a Master of Library Science degree from Delta State University in 1978 and a Master of Library Service degree from the University of Alabama in 1980. Mr. McCarver joined the Mississippi Library Association in 1976, and has served as chair of the Elections Committee, Intellectual Freedom Committee, and Mississippi Government Documents Roundtable, as well as being a member of the MAGNOLIA Database Selection Committee. The University of Southern Mississippi Libraries invites friends and colleagues of Mr. McCarver to join us in a celebration of his lengthy career in librarianship and to offer best wishes for his retirement. A reception will be held on Thursday, June 16, 2016, 2:30-4 p.m. in Cook Library Room 123, on the Hattiesburg campus. 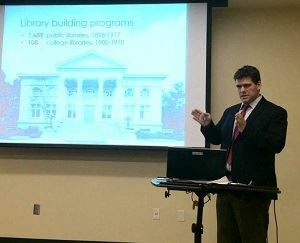 Dr. Matthew Griffis, Assistant Professor for the School of Library and Information Science at Southern Miss, appeared as a featured speaker at Emporia State University’s National Library Week celebrations on April 14th. Dr. Griffis’s paper, entitled “Town and Gown: Celebrating the Carnegie Libraries of Emporia, Kansas”, explored the history of the town’s two Carnegie libraries: the Anderson Memorial Library of the former College of Emporia, and the Emporia Public Carnegie Library, which served Emporia residents for almost 70 years. 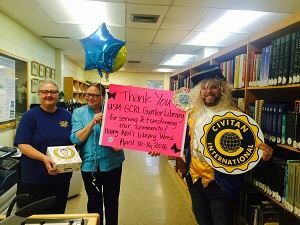 On Wednesday, April 13, Keith Wilson, President of the North Bay Civitan Club, visited Gunter Library with balloons, donuts, and poster to offer thanks for supporting the Club. Gunter Library has partnered with the North Bay Civitans on service projects such as promoting their annual special needs Easter Egg Hunt and Gobble Wobble Thanksgiving Bridge Walk to collect food for The Lord is My Help. Shown from left to right are Library Assistant Maryanne Anthony, Librarian Joyce Shaw, and North Bay Civitan Club President Keith Wilson.